Julie Uhrman isn't asking the world for a million bucks. No, she's asking for just under it to produce a new $99 Android-based video game console called Ouya ("ooh-yuh") that will challenge the way Sony, Microsoft and Nintendo have been bringing games to you on your television for years. "We don't think the console-makers are dead," Uhrman said in an interview with Kotaku. "We just think it's time to rethink how they do their business. We don't like it when people pay $60 for a game and feel cheated. We don't like it when developers can't work on a platform because it's too expensive." Enter: Ouya, a fully hackable console with the same Tegra 3 chip as the new Nexus 7 tablet and a twin-stick controller that also includes a touchpad. Enter a system that is being pitched as a platform for both indies and big companies, a console that is fully open to develop for and on which every game will be free either initially as a demo or as a free-to-play game. But Ouya will only be made with crowd-funding, so today Uhrman and her team, which includes early Xbox pioneer Ed Fries and One Laptop Per Child designer Yves Behar, are launching a grand appeal on the crowd-funding service Kickstarter. They're asking for $950,000 over the next 29 days. If they hit their goal, they're promising their new console by March 2013. It's been 11 years since the last successful insurgency into the home console war. In 2001, Microsoft barged into a scene contested by Sony, Nintendo and Sega. Very slowly, the Xbox found its place. On either side of the timeline, we've had the likes of 3DO, the Phantom, Project Nuon and other console contenders that couldn't last or, as has been more common, couldn't even get started. Uhrman, naturally, says the time is right for Ouya. The longtime gamer and former boss of IGN's downloadable games division senses a "brain drain" among console game developers. She sees top game creators bailing on the expensive business of making games that will run on Xboxes, PlayStations and Wiis and seeking better profits and more creative freedom by making games for cellphones and tablets. There's just one problem, she says: those new games they're making don't run on TVs, not with a controller. Ouya is built to address that. The Ouya box is small and designed to either be a conversation piece or to be easily tucked away, whichever the player chooses. It and the controller were designed by Yves Behar, designer of the One Laptop Per Child computer. "Just because it's inexpensive it doesn't mean it's cheap," Uhrman said of the console. "We have designed this to be beautiful." Ouya would work like any other Android platform. Development would be open. "Every console is a debug kit," Uhrman likes to say, drawing one of many distinctions between her machine and the closed Microsoft, Sony and Nintendo systems. The established players in home gaming only let licensed developers make games for their machines and only grant those creators the debug kits that are essential to creating games. The big three console makers must approve all game development and serve as gatekeepers for nearly every game made on their machine (the sole exception is the community-approved Indie gaming channel on the Xbox 360). Uhrman believes that the current closed system of home console gaming stifles creativity and is out of step with the popularity—Apple's walled garden of iPhones and iPads not withstanding—of open platforms. "I just think closed is the wrong way of doing things," she said. "I see unbelievable indie content out there, and watching ‘Indie Game the Movie' and watching their faces as they wait for Microsoft to approve [their game], it just didn't make any sense." This new console will be so open, that its backers are expecting and asking for it to be hacked. "We decided, ‘let's take this as far as it can go," Uhrman said. "So if you want to go in and hack the box, go ahead and do it. We hope you do it." In a follow-up e-mail, she was more specific about just how far under the hood the Ouya crew would let a hacker go: "The circuit board will have well-documented test points. People can swap out chips, add, etc. We may even publish the hardware design if enough people are curious. Because Ouya will also have Bluetooth and a USB, hardware hobbyists can also make their own peripherals (someone already suggested pinball controls to us). Regarding the software, you'll be able to root the device easily. It won't void your warranty. Every unit has a debug console. We are even working on the idea of a "plant"—which will restore your profile after rooting your device (reverse your root). Because it's built on Android, you'll understand the source code well, too. (Obviously if a hacker roots the device, our integrated user experience and game store will no longer be available while the device is rooted — so there is, as always, a tradeoff between customizing your device and enjoying the benefits of standardization. We expect the true hackers to be an elite, but small proportion of the total number of people who buy the box. Most people will probably just use the standard setup.)" This kind of openness is anathema to an outfit like Nintendo, that frowns on people even tinkering with their Wii to play a game that's not coded to run on consoles sold in a specific part of the world. It is also a hazard that could fracture Ouya the way so much of the Android experience already is fractured, leaving gamers and game-makers uncertain about which games, which hacked controllers and even which hacked consoles can run what. The same is true, of course, for PC gaming, which has been flourishing on its open platform for decades. If this is sounding so open that it doesn't sound like a console anymore, Uhrman said we can still think of it as one thanks to the controller. It ties it together. It makes this thing a TV-gaming machine in a way that other Android devices, even if they can connect to your TV, are not. "Ouya is a video game console first," she said. "To be emotionally immersed playing games, you need a fast and accurate way to control the game — and, for most games, only a controller with precise sticks and responsive buttons can do that." Ouya currently has no Super Mario Bros.. It doesn't have a Halo, either. What it's got is a litany of testimonials from indie developers who say that Ouya is a great idea. They say they'd probably or maybe make or port a game to it. There are some smoke and mirrors here. The Kickstarter video shows Minecraft on Ouya's system dashboard, which might be possible without further development given that Minecraft is available on Android. But Carl Manneh, who helps run Minecraft development studio Mojang told Kotaku that he and his colleagues "haven't seen it nor committed to anything." He added: "but we do like the idea!" Loving the idea and wanting it to succeed seems to be the status for a raft of top indies, including Canabalt creator Adam Saltsman and Wasteland creator Brian Fargo. The Ouya team assumes that they'll simply be awash in, at worst, top Android games. Uhrman doesn't want to settle for that. She wants to use part of the funding for the new console to fund the development of games. On Kickstarter, the Ouya hype reel shows mega-pubisher EA's Madden football game on the system's dashboard. Again, not quite. The Ouya crew has mostly reached out to all-star indie developers. Asked what kind of traction they've gotten with the likes of EA, Activision and Ubisoft, Urhman said, "We've talked to a lot of the AAA publishers. As you can imagine their questions about a new platform are similar to what anybody's are: ‘So you have an audience?' ‘Do you have great graphics?' and ‘Why would somebody want another box?'" The audience part might be proven out in the crowd-funding, if enough people pitch in to reach the $950,000 goal. "I think the openneess and variety of games for Ouya will trump what something else can do technologically," developer Fargo told Kotaku. "They have a good price, a familiar OS. You don't have to make games just for this." But there's that last question… "Why would somebody want another box?" If they already have an Xbox 360 or a PlayStation 3 or are buying a Wii U this fall. For one thing, Uhrman said, her console will only cost them $99 more. "I think this is for everyone. There's no reason they wouldn't get this too. I think there are going to be great games on mobile and Androud that they wouldn't be able to get on consoles." Through Ouya, they'd be able to play them on their TV, with a twin-stick controller. "I think it will start as an indie/casual platform," industry analyst Michael Pachter told Kotaku. He's been briefed on the device. "I don't see them attracting publisher support until there is an installed base. It's chicken and egg. I think it is powerful enough for $99, and will accommodate most XBLA type games." 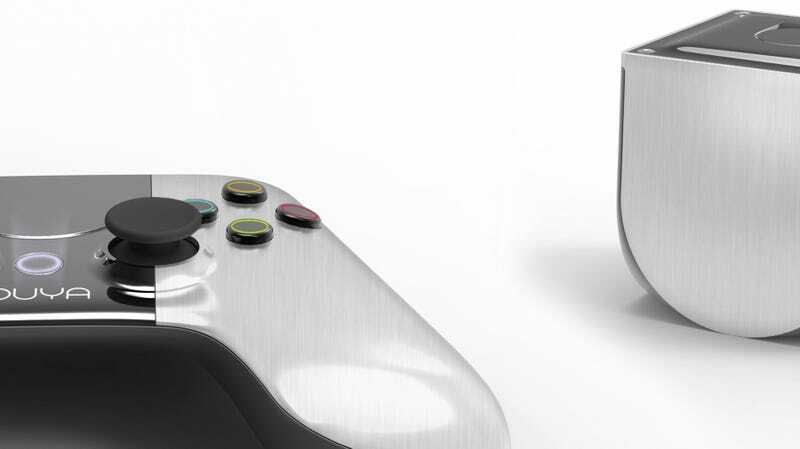 Up until now, the Ouya project has been funded by angel investors. Venture capitalists, Uhrman said, "are still scared away from hardware." That's why they're asking regular people for nearly a million bucks. That's why they're basically saying that even though Bill Gates' fortune made the last successful insurgent console, the common gamer or ambitious game developer is needed to make the next one possible. Donate $90 and you're insured a console, but only if the thing gets funded and made. "We believe this is really the people's console and we want to get their support," Uhrman said. "More importantly, we need the money. If the world does not support this we will not exist." If you're interested, their Kickstarter is here. UPDATE: $950k target achieved in just eight hours. Amazing.